I ran across this cocktail back in the September, 2009 issue of Imbibe and decided I really should give it a try. When you have a bottle of crème yvette or a bottle of crème de violette, you don’t pass up opportunities. Astute cocktail drinkers will quickly recognize the similarity between this and the original recipe for the Aviation Cocktail. The key difference is that the Blue Moon, doesn’t contain Maraschino liqueur and contains a lot less lemon juice. In Vintage Spirits and Forgotten Cocktails (from which Imbibe took it’s recipe), Ted Haigh (a.k.a. Dr. Cocktail) mentions that in its hay day the Aviation didn’t contain crème de violette. According the Haigh, the first mention of the incarnation here was in an obscure tome called Crosby Gaige’s Cocktail Guide and Ladies’ Companion in 1941. Not having that volume on my shelf, I’ll take his word for it. By 1952, David Embury mentions it in his book The Fine Art of Mixing Drinks as either the Blue Moon or the Blue Devil. They both mention that the drink can also be made with the addition of an egg white to give the drink a bit more body as in the classic Ramos Gin Fizz. It was summer and I was thinking lighter, so no egg for us. Shake with ice and strain into a chilled cocktail glass. Garnish with a twist of lemon. 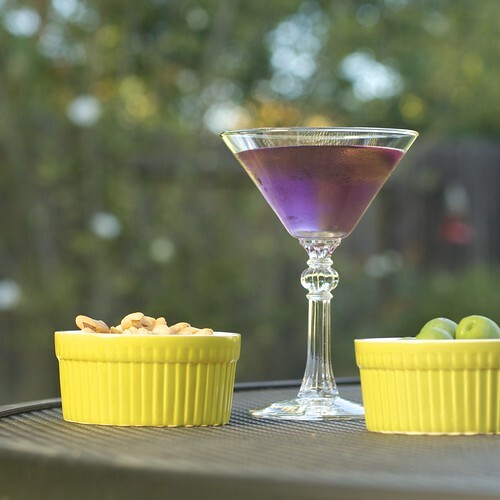 Though definitely similar to the Aviation, the lower amount of lemon juice and the lack of Maraschino liqueur, make this drink quite a bit dryer and allows the floral taste of the crème de violette to come through a bit more. While this may not be one of history’s great cocktails its certainly a pleasant enough way to idle away a frivolous summer afternoon. Not surprising, I’m sure, but Lala had a bottle of this. Didn’t she drink it straight? Seems a little perfumy and a lot sweet for that. If I’ve understood you right, the Emburry’s book contains the recipe of the Blue Moon with egg white, isn’t it? That sounds extremely interesting. Actually I’ve been a huge fan of cocktails (especially gin sours) with an egg white since I tasted a properly-shaken Clover Club some years ago. And I am a big fan of Aviation too. The combination of silky body of Clover Club and floral beauty of violet liqueur sounds yummy 🙂 Could you write a recipe from the book? How much egg white they recommend to use? Interestingly, his basic recipe is 1 part Creme Yvette or Parfait Amour, 2 parts lemon juice and 8 parts gin. He off hand mentions that sometimes and egg white can be added (but then the drink must be shaken). He also mentions that in Paris he heard it called a Blue Bird and they used Blue Curacao.